The name of the province we’re visiting, Gansu, was first used in the Song Dynasty (960–1279 AD), after two areas belonging to previous dynasties were combined. One area was previously named Gan; the other, Su. The Silk Road passed through Gansu, following a narrow route between the Tibetan Plateau (too cold!) and the Gobi Desert (too hot!) that’s known as the Hexi Corridor. Zhangye was one of the stops on the Silk Road, and Jiayuguan was at the westernmost end of the area controlled by the Ming Dynasty. While the main focus of this trip is the Danxia Landform, the Buddhist sites and relics left by Silk Road travelers, and the Great Wall in the area of Jiayuguan, are also well worth a look. Fly from Beijing to Jiayuguan; visit Jiayuguan Fortress; overnight in hotel. Private bus to Zhangye, check in to hotel in Zhangye; hiking in Danxia Landform; visit Zhangye’s Giant Buddha Temple; overnight in Zhangye. Hiking in Binggou Rock area; overnight in Zhangye. 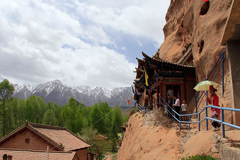 Visit Horse Hoof Temple and hike; private bus to Jiayuguan; overnight in hotel. Visit First Beacon Tower of Ming Dynasty Great Wall; fly back to Beijing. 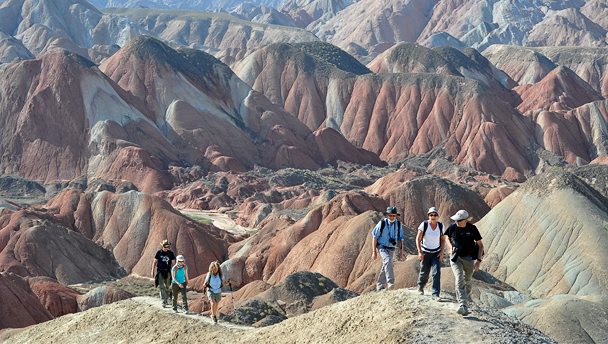 Hike deep into the hills and valleys of the Zhangye Danxia Landform. China boasts many different kinds of unique and beautiful landscapes, from towering limestone karst mountains to expansive grasslands that reach as far as the eye can see. 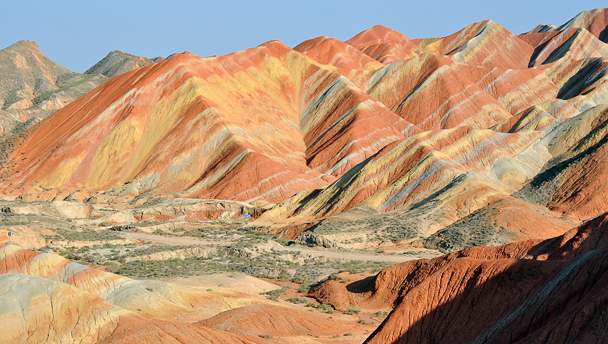 Formed from red sandstone beds by combination of erosion and uplift, the Danxia Landforms are also spectacular sights. 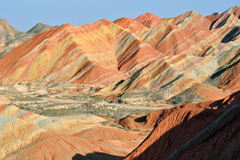 Some Danxia Landforms have been listed as UNESCO World Heritage Sites. The Silk Road passed through Zhangye, bringing many travelers, but nowadays many choose to head straight to Jiayuguan. While in Zhangye, we’ll visit the Giant Buddha Temple, and the Horse-Hoof Temple and Caves. Built in 1098 AD, and extended and renovated during the Ming and Qing Dynasties, Zhangye’s Giant Buddha Temple houses the largest indoor reclining Buddha in China—nearly 35 metres from head to toe. The reclining pose signifies entry into nirvana. We’ll also see a variety of architectural styles in the temple, with the Ming and Qing Dynasties represented, amongst others. The temple was built here after the Emperor of the time's tutor in Buddhism followed the sound of heavenly music and found buried an ancient statue of Buddha, reclining in the same nirvana pose of the Buddha we'll see in the temple. Some of the earliest Great Wall was built during the Han Dynasty (206 BC–220 AD), including a line of rammed earth ramparts that stretched out into the desert. It’s said that these fortifications, and the soldiers stationed on them to repel attacks from nomadic tribes and bandits, played a large role in making the Silk Road safer for travelers and increasing the volume of trade along the way.. Some Han Dynasty sites remain, and on this trip we’ll visit ancient tombs to see frescoes that are illustrative of the customs and dress of the times, and we’ll take a look at a section of the Han Dynasty wall known as the Hanging Wall, said to have been restored using the Han Dynasty construction techniques. The fortress at Jiayuguan marked the western end of the main line of Ming Dynasty (1368–1644 AD) Great Wall, but some watch towers were built further to the west. Near a deep canyon, we’ll find ‘The First Beacon Tower’, built to give early warning, via smoke signal, of approaching attackers. The West Gate of Jiayuguan Fortress, seen from the desert outside the walls. 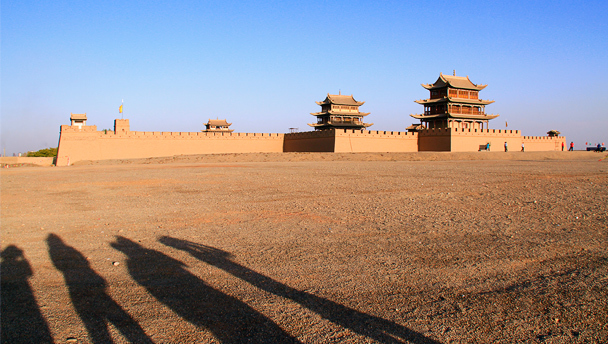 Jiayuguan Fortress is known as the western-most end of the Ming Dynasty Great Wall, and was one of the most important fortifications of its time, guarding the western entrance to China from the Hexi Corridor. The fortress has three defense lines – a moat, an outer city wall, and an inner city wall. There are gates on the east and west side. The fortress looks spectacular, with Great Wall climbing from it to the mountains in the north and south, and multi-storey towers and halls inside the walls and moat. We’ll visit the fortress on the first day of the trip. In ancient times, banishment was a common form of punishment. If you were banished ‘to the West’, it's out through the west gate of the Jiayuguan Fortress that you'd pass. May is one of the best times of the year to visit the area, with an average high temperature of 23°C, an average low of 8°C, and not much chance of rain. We will be staying in 4-star hotels in Jiayuguan and Zhangye. You’ll be sharing a room at the hotel with another hiker. If you'd like a room to yourself, it can be arranged at an extra cost of 750 RMB for the whole four nights, if a room is available—usually not a problem! We fly to and from Jiayuguan for this trip. Transportation between Jiayuguan, Zhangye, and the various scenic locations will be by private bus. On the third day of the trip we hike in the Binggou Rock area, where we'll see tall, eroded cliffs and outcrops. See a set of 38 photos from our May 2016 visit to the Zhangye Danxia Landform and nearby Silk Road sights in Jiayuguan. 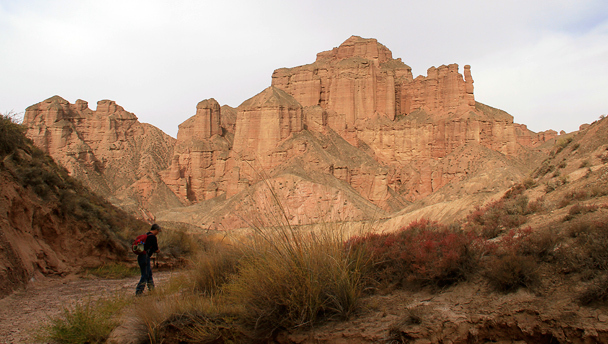 Photos from a five-day trip through Gansu, featuring the Zhangye Danxia Landform and the Jiayuguan Fortress. 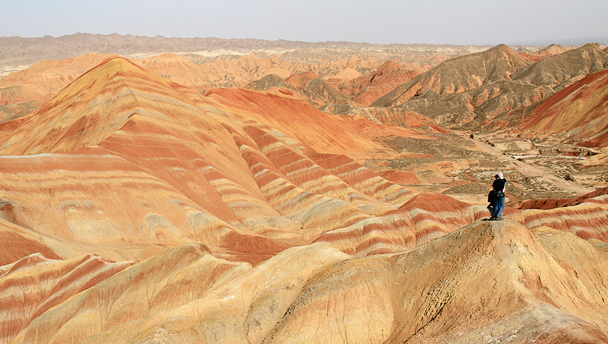 Photos from our five-day adventure trip in Gansu Province: the Zhangye Danxia Landforms, sculpted sandstone cliffs and valleys, and the Matisi Grottoes. 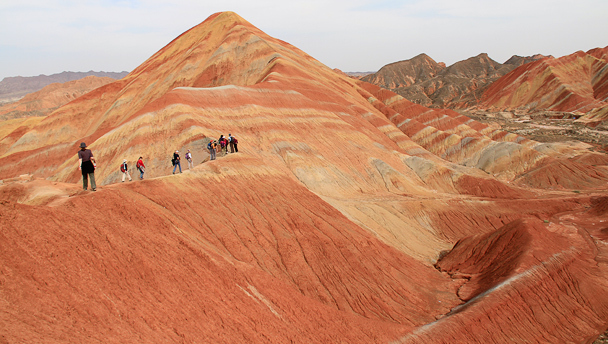 In October 2012 we made a trip to Gansu Province to see the fortress at Jiayuguan, and the spectacular scenery of the Zhangye Danxia Landform. Click through to see photos! 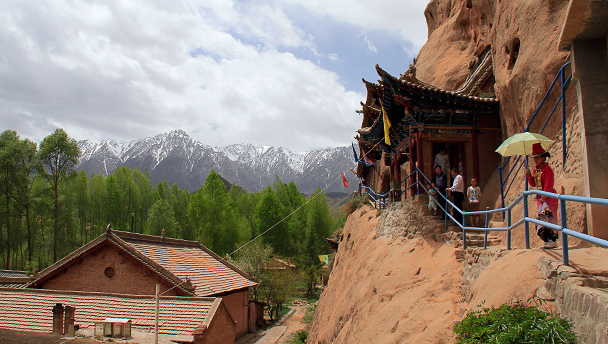 In May we headed out to Gansu Province for a good combination of hiking and visits to culturally significant historic sites. Click through to see Huijie’s excellent photos. During the October holiday we did two trips way out west – the second trip was to the Danxia Landform in Gansu Province, an area of multi-coloured sandstone hills and mountains. The scenery is hard to describe, so click on through to see photos! 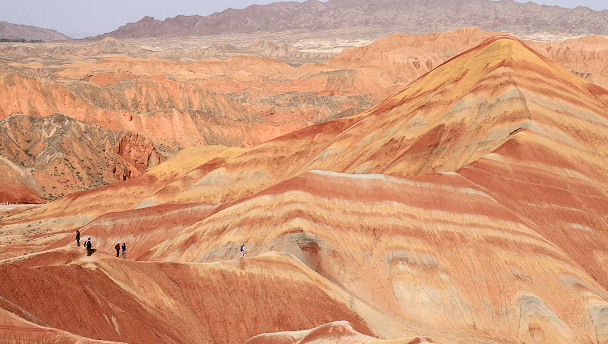 In May 2011 we made a trip to the see the spectacular scenery of the Zhangye Danxia Landform in Gansu Province. Click through to see photos of the stunning colours of the mountains, as well as camels, Great Wall, and a short stone prospecting detour. Click through for photos and more!